Exposure therapy is a form of CBT, and is aimed at maladaptive, excessive, or unreasonable anxiety. That is, for example, someone with OCD (obsessive-compulsive disorder) will touch a doorknob, and they’ll think, “Oh, if I touch this doorknob, I might get a disease like HIV.” So again, the anxiety is out of proportion to the actual experience. The intention in exposure therapy is to get your brain to signal you in a more accurate way. In an anxiety disorder, your anxiety system is giving you misinformation. It’s giving you information that you’re in danger when you’re,in fact, not in danger. So exposure therapy — the idea is that we have you systematically confront your fears: go into those situations that are causing you anxiety. The idea is that you don’t leave that situation and you don’t do anything to protect yourself. It’s a very difficult treatment because your anxiety actually feels like it’s increasing in the moment, and it is increasing in the moment. As that bad thing doesn’t happen, the feared consequence doesn’t happen, your brain starts to learn something new — “Oh, bad things don’t happen in the situation the way that I thought” — and your anxiety naturally starts to come down on its own. 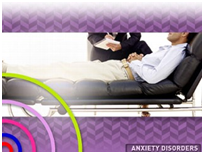 And that’s what we think is helpful in the treatment of anxiety disorders. So with repeated exposures to those kinds of situations — where you go into the situation, you don’t escape, you don’t protect yourself — your anxiety will go down on its own, and you’ll have less anxiety in future similar situations.